Listening to Hop Along's stellar fourth LP, Bark Your Head Off, Dog, it's almost hard to believe the richly textured record was self-produced. Fans will no doubt be struck by the layers of strings, Rhodes and backing vocals woven into the band's familiar mix, while their four-piece instrumental core sounds more polished than ever and gels beautifully with a dazzling array of overdubs. It's a unique chapter in their discography, but one that is sure to delight longtime listeners and newcomers alike. Hop Along singer, guitarist and songwriter Frances Quinlan makes clear that this is hardly a restless experimental turn, but rather the fullest realization of what Hop Along's sound has always been capable of. "For [2015's] Painted Shut, it came out the way it did just because time was limited," she says. "Coming out of that, we knew that for the next record we would require more time in the studio, so we tacked on a couple extra weeks to add layers and strings and Rhodes and more backing vocals. We worked on these songs knowing that we would have the freedom to do as much as we want." The band capitalized by utilizing their own in-house engineering expertise, and commanded a rare autonomy over the recording process. "We're so fortunate that our lead guitar player [Joe Reinhart] is also an excellent producer," Quinlan points out. "We've actually always had that resource, and technically all of our records have been made at his studio. Had we gone somewhere else, we would have had to cut time, because it would not have been half as affordable. Also, by producing everything ourselves, we were able to save money to spend on more time." Many tend to think of DIY in terms of low fidelity and live-off-the-floor recording, but Hop Along's strategy gave the nine songs on Bark Your Head Off the treatment they deserve. Taking advantage of time and letting things develop organically is essential to Quinlan's songwriting process overall and her lyrics are culled from years of note-taking and reflection. "I write a little bit every day," she says, "and 90 percent of the time, it won't really become anything but journal entries. Maybe a moment will strike me, though, and if it sticks with me long enough and affects me later on then it has the potential to become something." On Bark Your Head Off, these creative sparks emerge from history as well as present experience. Quinlan describes how the band spent hours on tour listening to a podcast about WWI that inspired her to do further research on the subject upon their return to Philadelphia. "I spent an afternoon reading a bit more, and I think I actually wrote a fair chunk of the lyrics at the library," she says of the song "One That Suits Me." The album's second single, "Not Abel," also has a literary bent, taking inspiration from Karl Knausgård's A Time For Everything and its portrayal of the deeper brotherly relationship between Cain and Abel. "He really is able to give life to tiny moments," Quinlan explains, a quality often ascribed to Hop Along's songwriting as well. "The domesticity of his version [of the story] really struck me, which of course is not at all present in the Bible. I like that it feels so real." This more empathetic approach translates beautifully into the band's own musical interpretation, which features their most ambitious studio arrangement to date, incorporating sweeping string sections and subtle plucks of mandolin. While the ability to unpack a variety of subject matter is one of Quinlan's greatest strengths, there are recurring themes of power and patriarchy threaded through Bark Your Head Off. "How You Got Your Limp" describes a drunken professor being corralled out of a bar while loudly "condemning his students" and asserting his privilege; a 19-year-old employee is arrested at work and re-convicted; and military generals bark orders and issue threats on "One That Suits Me." Quinlan notes how it is "so strange to be shaped by such strange men" on several different songs, and the sentiment is sadly on point. Documenting these everyday alienations has always been an integral part of Hop Along songs, and Quinlan's time in the demanding and often-problematic service industry has given her a first-hand perspective. "I feel more confident writing about that experience than a profession I've never taken part in," she explains. "Serving people, you see that quality we often have of feeling owed something. It's a funny business. I think we find ourselves forgetting each other's humanity all the time." Despite chronicling these occasionally bleak moments, Quinlan doesn't see things as generally irreparable or hopeless. "I really do not consider myself a cynical person, despite what my work might convey," she says. "We're seeing people wake up in some respects, and I'd like to think that our future adults will do a little bit better than our predecessors." 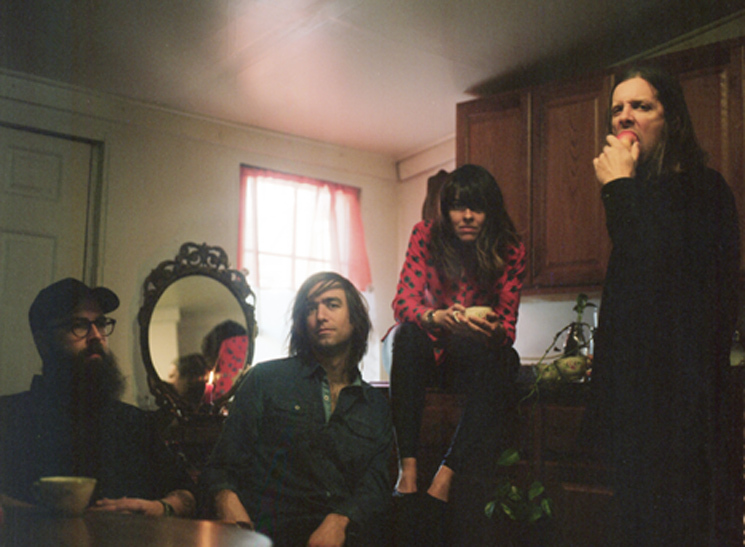 Hop Along's focus tends to be more quotidian, though, stringing together experiences and observations in order to provoke reflection rather than issue directives. This is what makes songs like "Not Abel" so effective: a subtle re-framing or re-contextualization can call into question even the most familiar fable. "Good and bad aside, humans are very complicated and I certainly try to capture that," Quinlan says. Overall, Bark Your Head Off proves to be her most effective attempt yet, and its songs use every tool at the band's disposal to provide more lyrical and instrumental detail than ever. The record may be Hop Along's most ambitious and polished release thus far, but in its essence it is a DIY masterpiece.